This French delicacy, labled by Julia Child as “certainly one of the most delicious beef dishes concocted by man”, comes to you from no other than my very own Mom. 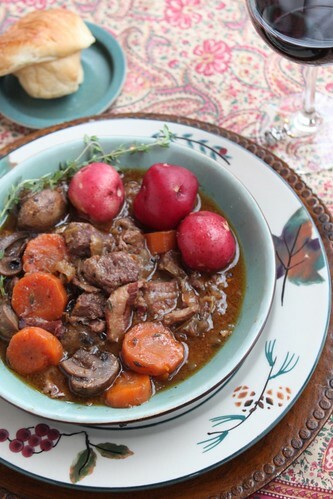 That’s right, the lady who we tease about being “Irish”, and who would much prefer to set the table then make the food, made Beef Bourguignonne. In fact, this isn’t the first time she has made it – I would go so far as to call this one of my mom’s signature dishes. I can remember coming home from college to this meal. It instantly became my perfect comfort food. After a long week on a new service, mom invited us over for Sunday dinner, and this was the absolute perfect compliment to a snowy and cold February day. At first I figured that because it came from a crock pot, it must be easy…. Don’t be fooled – this recipe is actually quite a bit of work because everything has to be browned before slow cooking. However, it’s great for company because all the work can be done early morning and then you can relax the rest of the day and actually visit with your guests. It is a stick to your ribs kind of meal that will certainly get you through this seemingly endless winter. Place the flour in a large bowl. Season the beef with salt and pepper, add to the flour and stir to coat evenly. Transfer to a plate, shaking off the excess flour. In a large sauté pan over medium-high heat, warm the olive oil until almost smoking. Working in batches, brown the beef on all sides, 5 to 7 minutes. Transfer to a slow cooker.Add the bacon, carrots, onions and garlic to the sauté pan and cook, stirring occasionally, until just tender, about 10 minutes. Transfer to the slow cooker along with the bay leaves, thyme, parsley and mushrooms. Off the heat, pour the wine into the sauté pan and set over medium-high heat. Whisk in the demi-glace and bring to a boil, stirring to scrape up the browned bits from the pan bottom. Add to the slow cooker, cover and cook until the meat is fork tender, 6 hours on high or 8 hours on low. Discard the bay leaves. 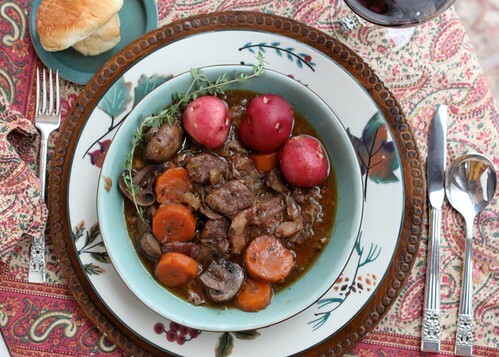 Transfer the beef bourguignonne to a platter and serve with steamed potatoes. Serves 10. This entry was posted on February 10, 2014 by Spice Is Nice. It was filed under Beef, Main Dish .